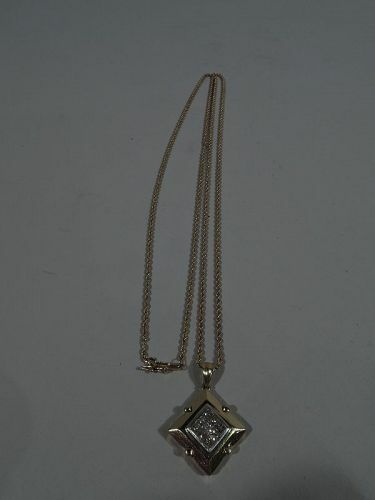 Lovely 18k gold and diamond pendant with 14k gold chain. Pendant is faceted lozenge with tubular pegs impressed on sides. Center inset with 9 square-cut diamonds (approx. total 1 carat). Back has pierced scrollwork. Rope chain. United States, mid-20th century. 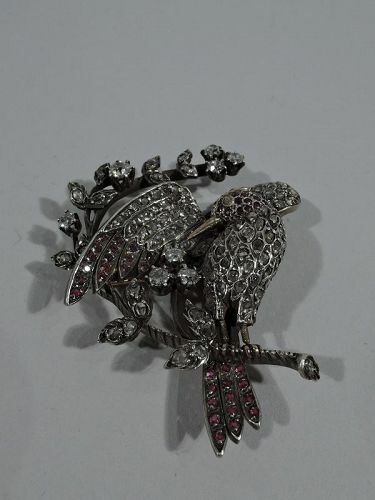 Charming figural silver brooch in form of bird. 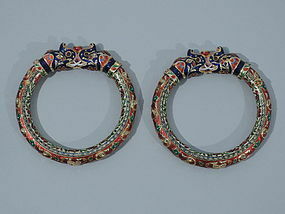 The bird is covered with inlaid rose-cut diamonds and faceted rubies on head, tail, and wing tips. Beak is gold as is ruby-encrusted crown – exquisite touches. The bird is perched on c-scroll branch covered with more rose-cut diamonds and eight larger miner-cut diamonds. Gold back. England, ca 1880. Excellent condition. 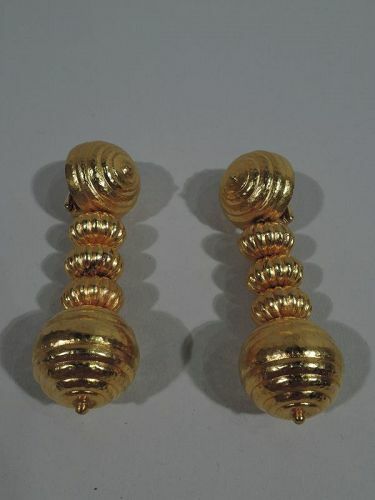 Pair of 18k gold beehive drop earrings by Ilias Lalaounis. Each: Large hemispheric hive with mounted clip and large spherical hive terminal bracketing three “mini hives”. Nice swing. Beautiful handiwork. Signed “A21-750 / Greece / ILIASLALAOUNIS”. Excellent condition. 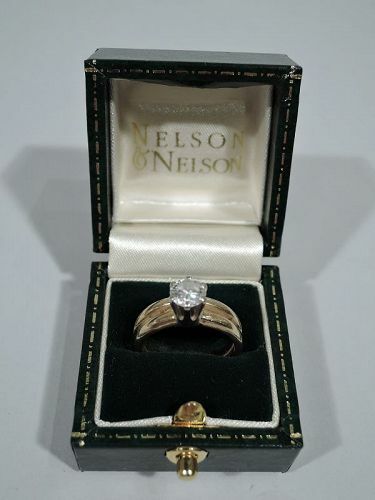 American 14k gold diamond ring. Double band with classic brilliant-cut diamond (approx. 0.72 carat) in white-gold mount. Very good condition. 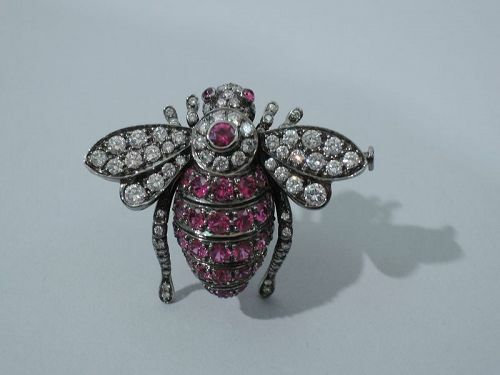 A fabulous 18K white gold bee brooch inlaid with diamonds and rubies. Made by Sabbadini in Milan, ca. 2000. Signed. Excellent condition. 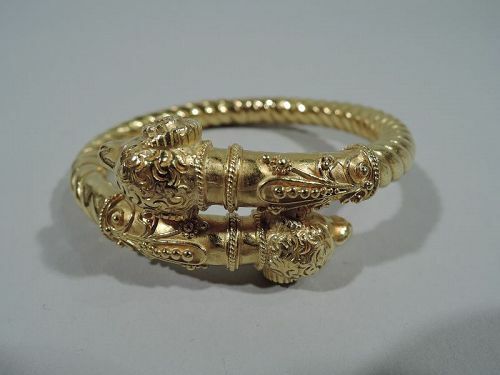 A beautifully crafted Etruscan-Revival 18K gold bangle bracelet with 2 ramâ€™s heads decorated with filigree bead work, floral filigree collars, and rope band. Italy, ca. 1890. Excellent condition. Fits a medium wrist. 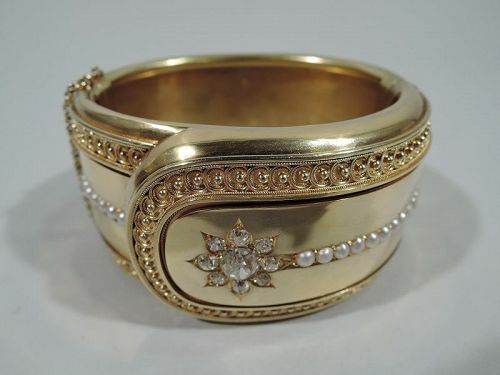 Victorian 18k gold cuff bracelet with applied rope and bead border and encrusted miner diamond starburst and seed pearls. England, ca 1880. Excellent condition. Unusual bar pin in silver, 18 kt gold, and enamel. Made in England, ca. 1880. 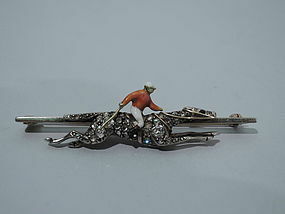 Enameled jockey with riding crop on gold and diamond mount. The horse has cabochon sapphire eye. Gold heightened with silver. Excellent condition with fine patina. Diamond and enamel eye brooch on 18 kt gold. Made in England, ca. 1880. 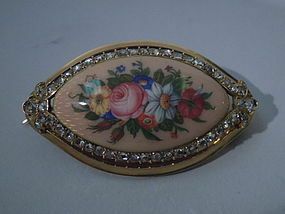 Oval enamel plaque with flowers on peach ground. 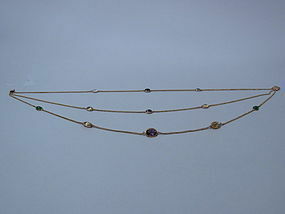 Bordered with rose-cut diamonds. Gold edge has engraved zigzag pattern. Traditional Victorian design without the fussiness. Pretty. An Antique early Victorian Silver topped gold figural flower pendant set with a multitude of rose cut diamonds that highlight every flower and leaf. 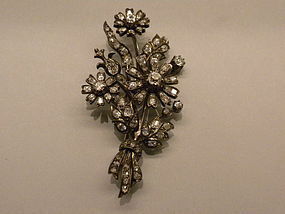 This silver topped gold design was the custom for much of the diamond jewelry produced in this era. English,circa 1850, approx. 4.25 carats of rose cut diamonds. Antique patina. Excellent condition, length 2 1/2".